Sometimes I really wonder if top 10 lists are of any use. After all, it is only a general statement of what we perceive as good. I've been struggling with trying to put together a top 10 list of my favourite restaurants to no avail. I'm still not sure if I will do one. For now, I am sometimes in utter confusion why some restaurants make it on the top 100 list on Urbanspoon. I'm sure there is a method to the madness and everyone has personal favourites; but I leave scratching my head after visiting some of the restaurants on that list. Today, Pomegranate and I were in Ladne r for a meeting. 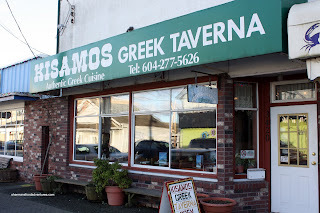 With it's relative close proximity to Steveston, I decided to satisfy a long-standing goal of mine to try Kisamos Greek Taverna. I was curious to see why this small little restaurant could hold down such a good rating. We made it out to Steveston rather late in the afternoon and I wasn't even sure if it would be considered lunch anymore. I wonder what we would call a late lunch/early dinner? Dunch? Linner? Lupper? Sunch? Dunno... Unlike other reviews I've read, I did not find the service rude or poor. We were greeted warmly by the server and she was quite pleasant throughout our meal. 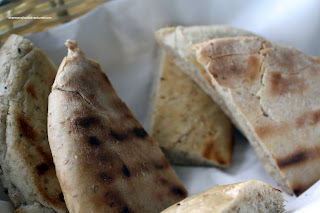 Being that Pomegranate loves Calamari, we got an order to start along with the Humus with pita bread. 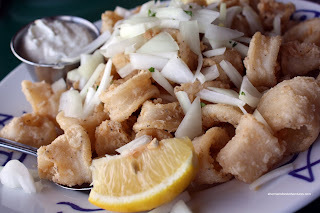 Arriving as a pretty large portion, the calamari was a bit odd. Some pieces were tender while others were quite chewy. Naturally, the bigger pieces were not as crispy as the smaller ones. This variation within the same dish made it strange to eat. This I realize is a personal preference; but we both agreed that it was a bit too chewy for our liking. We also felt the Tzatziki could've been more aggressively seasoned with more lemon and garlic. 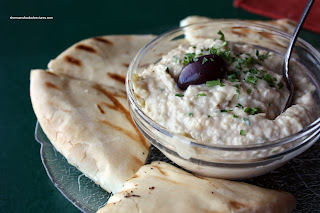 The humus was pretty good; however, it had a bit more tahini than we are used to. Thus, it was heavier on the sesame taste. I took the lemon from the calamari and squeezed it into the humus and that made it much better. Being quite ambitious, I went for my personal favourite - the Roast Lamb. For some reason or another, the large portion of lamb was smothered in a fairly salty and greasy sauce. I don't remember the last time that my roast lamb came swimming in sauce. 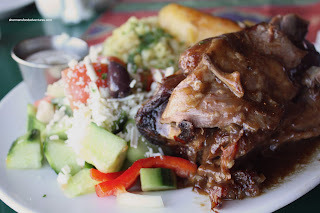 The lamb itself was fork tender and quite gamy (just how I like it). I suspect the sauce is actually the leftover liquid from the roasting; hence the greasiness and heightened lamb flavour. I really liked the rice as it was firm and modestly seasoned. The lemon potato was only passable. Texturally, it was excellent; but it could've stood for more flavour. Curiously, our very fresh Greek salad was completely flavourless. It also seemed like there was no dressing on it. Pomegranate had the Lamb Souvlaki and I thought it was cooked up nicely. A tad chewy, it was flavourful with strong hits of garlic and lemon. He felt it could've been a bit more tender. Again, this is probably just a matter of personal taste. On that note, we both agreed that the meal was alright; but quite uneven. 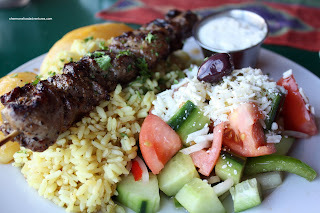 To me at least, the food seemed more "home-style" with a little less refinement than other Greek restaurants I've been to. That could be the draw for some people since it would be quite authentic. Again, I didn't dislike the meal, I guess it just didn't live up to the hype or expectations due to its lofty ranking.